Mustang trekking is the trekking of central Himalayan range of Nepal between two mountainous districts Dolpa to the west and Manag to the east. Mustang shares the border with Tibet to the north. 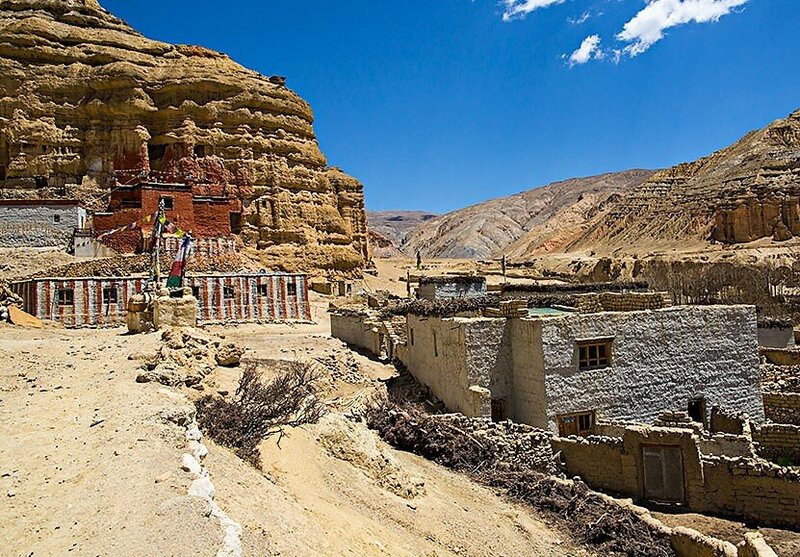 The upper region of Mustang was once a kingdom named Lo in dependency of Kingdom of Nepal. Lo Kingdom glorifies as the unaffected and preserved land of Tibetan culture. By the annexation of China, Tibet itself might have lost its aroma and custom. However, the once semi-independent Kingdom has kept its tradition and ritual alive and safe. Indeed, until 1992 foreigners were not allowed to enter into this prestigious and restricted land. Because of its still unexplored tradition and the exotic climate, In Nepal, Mustang Trekking has been the choice of many trekkers all around the world. In addition to its prosperous cultural identity of Tibetan lineage of Sakyapa School of Buddhism, it has also welcomed and sustained the Hindu tradition and rituals. The prime example of this harmony and cordiality is Muktinath temple which is the common shrine of both the religions. The curiosity and wonder behind the mutuality between these two religions in this high Himalayan district can be the point of research along with the wonderful and adventurous trekking you experience. Moreover, it was once the trade route between Tibet and India following the trail along the edge of Gandaki River which has bisected Mustang district. The word Mustang has Tibetan origin which means a ‘fertile land’. As a matter of fact, the district combines the two part; one includes the upper mustang, another the lower mustang. Two third of the northern part of the district has been consumed by the upper mustang. The lowest point of the upper Mustang measures 2750 meter from sea level whereas the highest altitude is 6700 meters. The lower Mustang is also called Thak. Thak Khola is also the name of the Gandaki River. This area has been the terrestrial of Thakali people. Mustang trekking can be the most adventurous as well as challenging as the barren land, high altitude and windy climate may play the role of hurdles. The windy and dry valleys, eroded canyons and stratified rock formation would be awe-struck geographical experience. Nevertheless, the Mustang trekking would offer you incredible taste and trajectory of human world. As a trekkers you would enjoy the glittering white snow-capped mountains. Furthermore, you would get astonished by the livelihood of the people who have been living their life perhaps among the highest altitude villages of the world. Besides, the preservation of rare medieval Buddhist arts as well as the historic outlandish Tibetan culture can be the major attraction of the Mustang trekking. Majority of the habitants of this high Himalayas land are recorded to be of Bhotia and Loba communities of Tibetan origin. As being the mountainous district Mustang also has been bestowed with the two mountains Dhaulagiri and Annapurna which stands at an elevation more than 8000 meters above sea level along with about 30 peaks of 6000 meters above sea level. Drive from Kathmandu to Pokhara (900m) 5 – 6 hrs. Night stay at a hotel. Fly to Jomsom and trek to Kagbeni (2,858m) 3-4 hours walk. Kagbeni to Chele (3,050m) 6 hours walk. Chele to Syangboche (3475m) 7 hours walk. Syanbochen to Ghemi (3520m) 6 hours walk. Ghaymi to Charang (3500m) 5 hours walk. Charang to Lo-Mangthang (3700m) 5 hours. Explore Lo- Mangthang and time for acclimatization. Lo- Mangthang to Drakmar (3810m) 6 hours walk. Dhakmar to Ghiling (3807m) 5-6 hours walk. Ghiling to Chhuksang (3050m) 5 hours. Chhuksang to Muktinath (3900m) 6 hours walk. Muktinath to Jomsom (2720m) 6- 7 hours walk. Fly from Pokhara to Kathmandu.